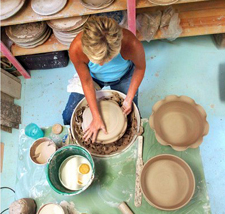 Susan Painter’s sought after “Beachware” pottery is as practical as it is whimsical. Each unique piece comes handpainted in bright Key West colors or in lively tropical colors. All are handmade by the artist on the potter’s wheel, many with hand crafted attachments, such as palm trees, fish, and shells. Everything Susan creates is food & dish- washer safe and most can go from the oven right to your table. Start, or add to, your collection by ordering online, or meet Susan Painter at an upcoming show.